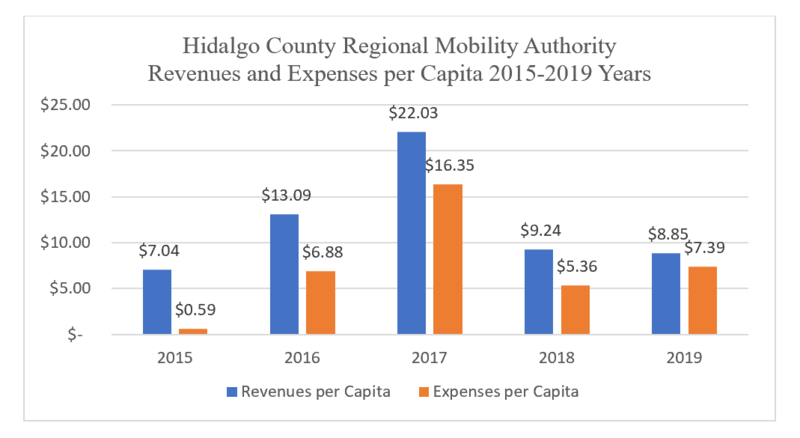 The Hidalgo County Regional Mobility Authority is committed to financial transparency. In efforts to increase the level of transparency, it has centralized financial data and other relevant information to facilitate accessibility. The Hidalgo County Regional Mobility Authority is an independent governmental agency created in November 2005 pursuant with Chapter 370 of the Transportation Code. The Authority is governed by a seven-member Board of Directors (the Board) appointed by the Governor of the State of Texas and the Hidalgo County Commissioners’ Court. The Board is responsible for setting policies, identifying priorities and ensuring the Authority is operated effectively. Board members, appointed to serve two-year terms, are volunteers and are not compensated for their service. The Authority's mission is to develop a publicly owned transportation system that creates jobs through increased mobility and access, is locally funded for reliable delivery, pays for itself in terms of future maintenance and funds new projects to meet the future transportation needs of Hidalgo County. The following summarized financial information is for the most recently completed calendar year 2017. Revenues are recognized when earned and expenses are recognized at the time the liability is incurred. The Authority does not collect property taxes nor sales taxes. Operating revenues consist mainly of vehicle registration fees (VRF) and truck overweight permits. The Hidalgo County monthly collects and remits the proceeds to the Authority’s trustee bank. 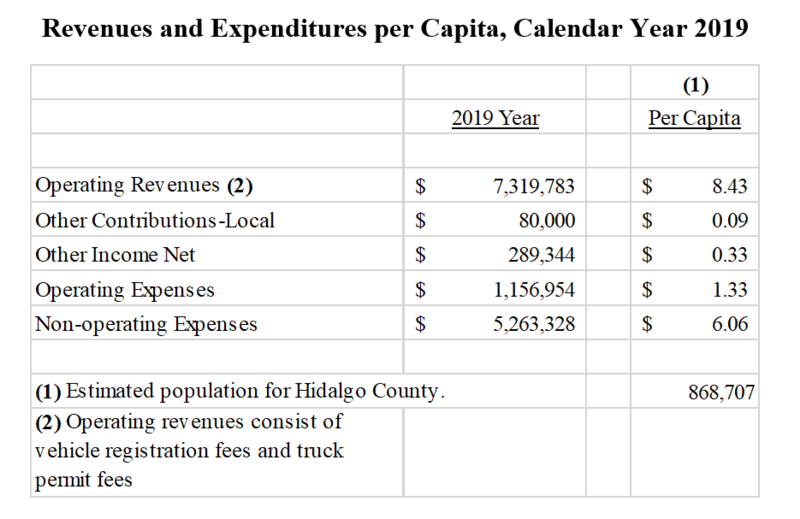 The per capita numbers are based on the estimated population of Hidalgo County. 2017 full-time employees — 8. ✔ Total Revenues for 2017: $18.9M; 2016: $11.1M; 2015: $5.9M:, 2014: $7.0M; and 2013: $5.4M. ✔ Total Expenses for 2017: $14.M; 2016: $5.8M; 2015: $494K; 2014: $605K; and 2013: $466K. ✔ Per Capita for 2017:860,661; 2016: 850,187; 2015: 840,113; 2014: 829,210; and 2013: 817,256. ✔ Vehicle registration fees, which averages between $5.5M-$6M per year, is the primary source of revenues for the Authority. A $10 fee per vehicle is collected by the Hidalgo County. The County transfers monthly the collections to the Authority’s trustee bank. The trustee bank keeps about 66% for the yearly debt service requirement and deposits the rest in the Authority’s bank depository for the administration expenses of the Authority. ✔ Overweight permits are currently assessed to trucks, which travel in certain roads of the County. The cost of the permit is $200 and the administration is handle by a third-party administrator. The distribution of the fee is as follows: $170 is remitted to the Texas Department of Transportation; $27 is remitted to the Authority; and $3 is kept by the third-party administrator. The Authority estimates an annual $1M in revenues. ✔ Federal and State Grants are mainly for road construction projects. The Authority is presently in the process of seeking funding to continue the next phases of road constructions. The goal is to attain a toll road project that will expediate the traffic flow of commercial trucks and vehicles. ✔ Annual Operating & Capital Budgets – An annual financial plan of its revenues and expenses for the calendar year. ✔ Annual Financial Statements & Independent Auditor’s Report – Annual Financial Statements in conformity with Generally Accepted Accounting Principles (GAAP) and audited in accordance with a Generally Accepted Auditing Standards (GAAS) by a licensed public Accountant. ✔ Unaudited Financial Statements – Monthly financial statements that have not been audited by a licensed Public Accountant. ✔ Check Registers – Display all payments made during a specified time period to include payments made by checks, ACH, or wire transfer. The HCRMA is NOW HIRING!